Ashleigh Barty, the baby-faced dispatcher from Ipswich, looks destined for greatness after wins over two-time Wimbledon champion Petra Kvitova and now former world number one Karolina Pliskova, writes our resident tennis tragic, PAUL O'HANLON. Australia’s Ashleigh Barty has just won her biggest tournament yet in taking out the WTA Miami masters in Florida. Seeded just 12 she beat the number 7 seed Karolina Pliskova in the final. Barty, the baby-faced dispatcher from Ipswich, looks destined for greatness after wins over two-time Wimbledon champion Petra Kvitova and this 7-6, 6-3 final win over former world number one Pliskova. 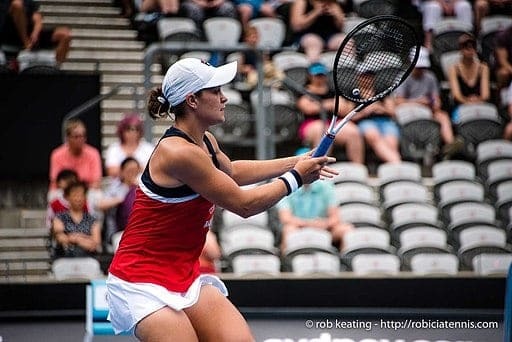 Now safely ensconced in the world top ten in both singles and doubles, Ashleigh might set her sights on emulating the achievements as the last great Aussie women’s player Evonne Goolagong Cawley who won 7 grand slam singles including two Wimbledon singles titles and 6 doubles titles. A girl’s singles winner at Wimbledon in 2011, who says Ash can’t win the Venus Rosewater dish? At last Australian tennis looks like making a breakthrough. So long in the doldrums an exciting young cyclone has stormed up the rankings. Part Aboriginal, Ashleigh Barty is now in the top ten after at last beating two-time Wimbledon champion Petra Kvitova in the quarter-final in Miami. It didn’t come easy – Barty had lost all their previous four meetings and was standing at match point down. Did Ash keel over? Not a bit. With typically steely determination she saved the match point and went on to win. Being brought up in the Queensland heat doubtless held her in good stead against central European Kvitova. This is her most significant win yet in her young career as she now moves up from 11 to 9 at least. She is also ranked in the top 10 in the doubles at number 6 with a variety of partners including fellow Aussie Casey Dellacqua. Next in Miami she played and beat Latvian youngster Anett Kontaveit in the semi finals with a possible meeting with former number ones Romanian, Simona Halep or Czech, Karolina Pliskova in the final, ultimately facing Pliskova to win in straight sets. I’m writing this speeding along by rail along the French Riviera through Monte Carlo with its famous clay court tournament – a warm up event in April for the Grand Slam French Open in May where Ash could shine. The US Open is in August 2019 in the searing heat of Flushing Meadows. Hotter still will be the Australian Open in Melbourne Park in January 2020. Incredibly the last Australian player to win the men’s title in Melbourne was Mark Edmondson in 1976 while the last Australian female winner was Christine O’Neil in 1978. All over 40 years ago – what’s gone wrong? Club membership has fallen by a third for one thing. An inspirational player like Ash could reignite interest in the game down under. Level headed and a natural sportswoman, she took a break from tennis for two years to concentrate on playing cricket, featuring for the Brisbane Heat in the Women’s Big Bash League, before putting on the tennis shoes again. Her temperament is excellent – she doesn’t throw tantrums or get upset about losing matches she ought to win or get big headed about wins over number ones, of which she has had quite a few. When I wrote about her in October 2017, she was ranked outside the top 300 and although she got up to 23, she was looking a bit ordinary – overshadowed by Sam Stosur. 18 months later what a difference has been made! She has climbed from 23 to 9 in a slow, steady, consistent fashion which may well be realistic to maintain. She’s still just 22-years-old remember and current Wimbledon Champion Angelique Kerber won there for the first-time last year at age 30. Kerber also won the Australian Open in 2016 at the age of 28. Current Men’s number one Novak Djokovic is 31 and don’t write off Roger Federer who clocked up his 100th title recently at the age of 37. I’d love to be there in Melbourne Park in January and see Ashleigh lift the trophy. That really would take me back to the era of Aussie greats like John Newcombe, Rod Laver, Tony Roche, Ken Rosewall and, of course, Evonne Goolagong Cawley.